Find winter veggies that are locally grown, like these, at local indoor farmers markets. - Time is running out to register at the regular rate for the Pennsylvania Association for Sustainable Agriculture (PASA)‘s Farming for the Future Conference, to be held Feb. 1-4 at the Penn Stater Hotel and Conference Center in State College. The annual event is widely regarded as the best of its kind in the East, and it brings together an audience of over 2,000 farmers, processors, consumers, students, environmentalists, and business and community leaders annually. Go to PASA’s website to register, and to get the regular rate, please do so by Jan. 24. - Have an itch to go to a farmers market? Fortunately, this area has several indoor markets to choose from. The Juniata Farmers Market in Altoona is indoors during the first and third Friday of every month at the Station Medical Center. 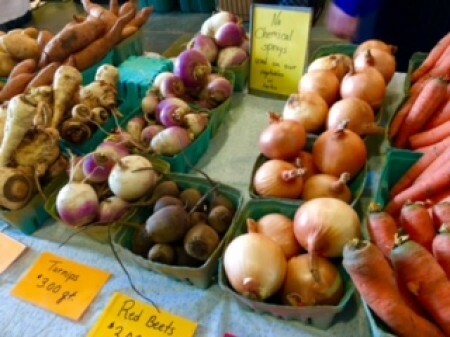 The State College Farmers Market is indoors on Fridays at the Municipal Building. On Tuesdays, the Boalsburg Farmers Market is at the St. John’s United Church of Christ. - Want to do some good work in the community? Check out the Happy Valley Timebank. What’s a timebank? Go here to find out more.